Congratulations to Kate M. and Michelle F. for winning the Blog-A-Versary party pack! Thank you to everyone who entered; you helped make my blog-a-versary a great one. If you would like to purchase the Echoes of My Heart album, head on over to amazon (it’s only $8.99 for 15 tracks). And if you’d be so kind to leave a review over there that would be such a gift! 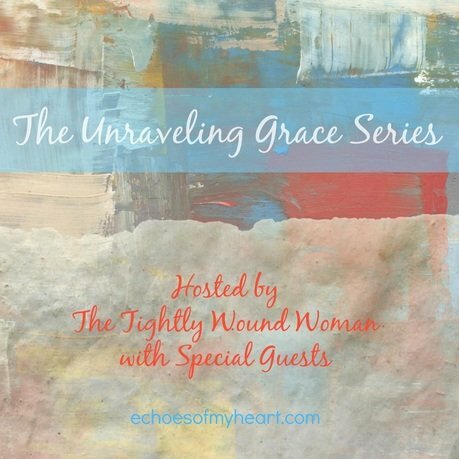 I am hosting The Unraveling Grace Series on the last Thursday of the month (January-May). I have invited five blogging friends to guest post here as we find grace in the unraveling of life. Make sure you read Jennifer Watson’s powerful post from last month. Now, grab a warm beverage and lean in as we listen, learn, and grow closer to His side and one another. 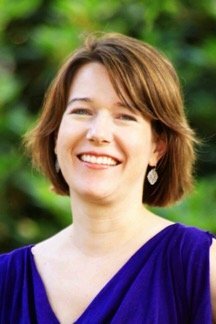 Abby McDonald is mom, wife and southern girl who fell in love with writing at a young age. She started Fearfully Made Mom because she felt God gently pushing her to share her writing with others who may feel alone in their struggles with self-doubt, accepting God’s grace, and finding their identity in Christ. Her desire is to show women they are fearfully and wonderfully made by a God who will relentlessly pursue them, even during their darkest times.When she’s not chasing her two little boys around, Abby enjoys hiking, photography, reading, and consuming copious amounts of coffee with friends.Abby would love to connect with you on her blog, Twitter, Facebook, and Pinterest. Let’s welcome the lovely Abby MacDonald today as she entrusts us with hard parts of her story so that we might be drawn closer to Jesus. I am terrible at the silent treatment. If there were a contest to see who could stay silent toward an adversary the longest, I would definitely lose. I just don’t have it in me. Conflict makes me anxious and uncomfortable. It’s funny how what is painful with our loved ones is often perfectly normal with God, isn’t it? I gave God the silent treatment for the better part of a decade. Sure, I sent up a sparse prayer every few months when life became particularly difficult, but mostly I said nothing. I remained speechless because I was angry. Although I wasn’t fully aware of it at the time, I tried to manipulate God. I was convinced that if he was who he said he was, he would do something. That he would save my family from the tangled mess that it was in. I was sure that if God was all-powerful, he would grab the attention of my prodigal brother. He would take hold of my sibling and turn his world upside down until he changed. You see, addiction doesn’t just affect the addicted. It affects everyone in his or her life. But it affects family members most of all. Some nights, I feared for my brother’s life. On occasions when he didn’t come home, I was certain the police would call with news no loved one should have to endure. But the struggle wasn’t just in my own home. I fought to move past hurt that extended beyond those walls as well. When I sought answers, I only became more confused. A bitter seed took root in my heart, and as time passed, it grew deeper and deeper. I sent up prayers asking the Almighty to please take these burdens, to please show his light, but it was He who seemed silent. So I became silent as well. My way seemed better than God’s way. I tried to control a situation that was far beyond my ability to control. Because I wanted it so badly to change. There are few places darker than the heart that questions God’s sovereignty. But that is exactly what I did for ten years.Even after I realized my need for him, it was difficult for me to return. Surrendering to what we don’t understand is terrifying. Until we take that step into grace, we don’t realize that the result is freedom. It took a cross-country move, a new baby, and year of post-partum depression to bring me to a place of acceptance. I was sure that the first year of motherhood would break me before God did. After months of seeing a therapist and sitting in the church pew on Sunday, I began reading a book about our life’s purpose. 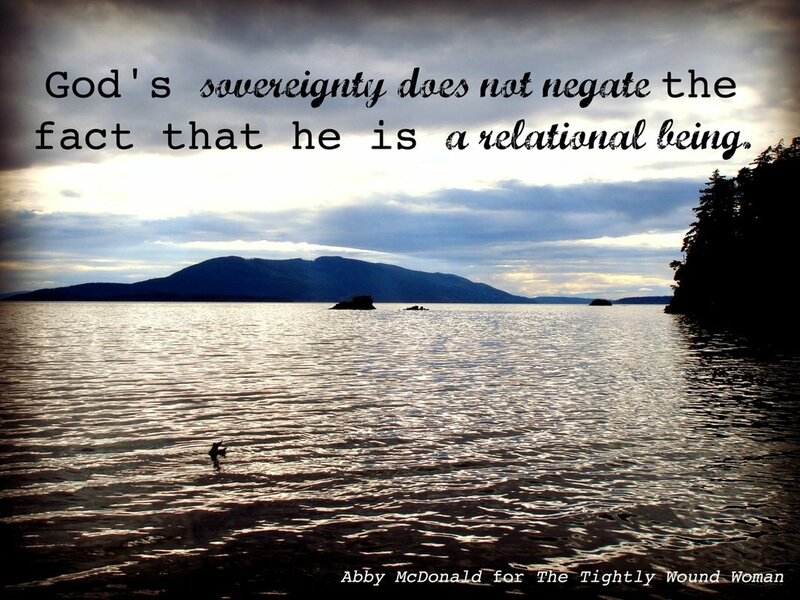 What I realized was this: God’s sovereignty does not negate the fact that he is a relational being. He gives us the freedom to choose. The freedom to accept him or reject him. When we relinquish control, the place of surrender becomes a point of hope. There is unsurpassed peace in simply accepting that God is God. I saw that hope in what we can see is not hope at all. “For in this hope we were saved. But hope that is seen is no hope at all. Who hopes for what he already has? But if we hope for what we do not yet have, we wait for it patiently” (Romans 8:24-25). 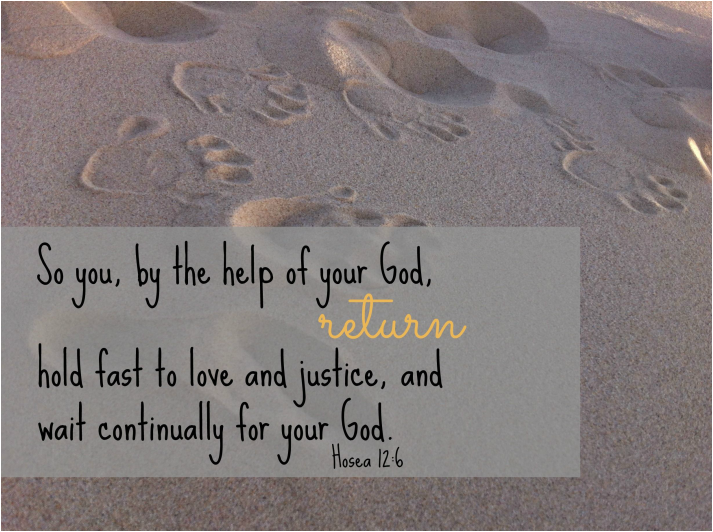 Even though I do not see the answer, the healing and restoration, I continue to hope. I put my trust in the Spirit who moves, and acts and pursues those who run to the darkest places. I hope because I know a Savior who conquered darkness once and for all. And one day, he will return to claim what is rightfully his. Unraveling Grace: Are you struggling to move past a situation in your own life where God seems silent? Could it be time to let it go? There is freedom and peace in surrender, even when we don’t have the answer.Where do you place your hope? Is it in visible results? Or is it in the sovereignty of a God who sometimes works in ways we don’t understand? What beautifully woven words. “When we relinquish control,the place of surrender becomes a point of hope.” I needed to hear this, this morning. I keep trying to control God’s efforts to woo my son back into His arms. I know that I need to let go and let God and trust, as you say, that He is a relational God (even to the lost). I will wait continually and patiently on Him. Thanks!! Bev, I will continue to pray for your son. You’ve been in my thoughts, friend. Thank you for visiting today. Much love to you and (hugs). This was beautiful and captivating. Addiction can be a nasty family-breaking thing for everyone. I’m sorry you have felt its sting. But I love this story of beautiful hope. Hope to hold onto, especially when God is quiet but there. Thanks for sharing this. Thank you, Dana. Your encouragement means a lot. We all have our own struggles with sin but some are definitely more devastating to life in general. My hope is in Him alone. I can relate to this writing on so many levels. I was an alcoholic 30 years of my life in three years after I finally got sober, I broke my neck and am now paralyzed from the shoulders down. I spent over a year in seething bitterness and anger and confusion. The irony that I broke my neck when I was sober! I’m glad to say that I’m digging through my Scriptures now, praying, and employing the prayers of friends to get through this stage of my life. Thank you for your thoughts and sincerity in writing this. Wow Terri- praying that God will use all this for His glory, but I’m also sorry for the difficulties you are facing. Are you familiar with Joni Eareckson Tada? She might be a real source of encouragement to you. Terri, I am so sorry to hear that you are going through this difficult time after getting sober. I am praying for you today and I hope that God meets you and give you grace to move forward. Thank you for sharing your story here. “There are few places darker than the heart that questions God’s sovereignty.” Surrendering to God’s will is the hardest first step we ever take. But it only takes a step to walk into the freedom and peace found in trusting Him. Thankful you took that step, Abby, and encourage me on this journey of surrendering my will to His will. I’m so glad we crossed paths in the blogging community, Crystal, and hope we can meet someday. Yes, surrender is the hardest step but it brings such unsurpassed peace. Thanks for stopping here, friend. You are such an encouragement to me, Betsy. Thank you for visiting here today, friend. Have a great weekend. This sentence right here “When we relinquish control, the place of surrender becomes a point of hope.” When I got saved 11 years ago, my prayer was Lord release me from control. Well I never knew then that he’d use children as the vehicle to shed the control. And just when I think I’ve surrendered, He calls me to new heights in Him and thus requires greater levels of surrender. And wouldn’t you know, I’m talking about surrender on the blog today too. Blessings sister.